For the first rain and pure fall day at home this season, soup was on the menu. Honestly it was purely a concoction of what was in the fridge. After separating two rotisserie chickens the other day I had two chicken carcasses to be boiled. After that it was simply what vegetables needed to be used. The kids both had seconds and enjoyed every bit of vegetables. Not to mention the smell of roasting chicken throughout the house was mouth-watering. I decided to use a wild rice/quinoa mix inside the soup as opposed to noodles or dumplings. It was just as tasty and much healthier. If you do not have a chicken carcass just use chicken stock or broth. Place chicken bones and water in a pot with a lid. Simmer for about 1 hours. Remove lid and allow to cool about 1 hour. Using your hands pick off any pieces of chicken and remove all bones and fat from the pot. Return your chicken stock and chicken pieces to the stove and turn to a medium heat. 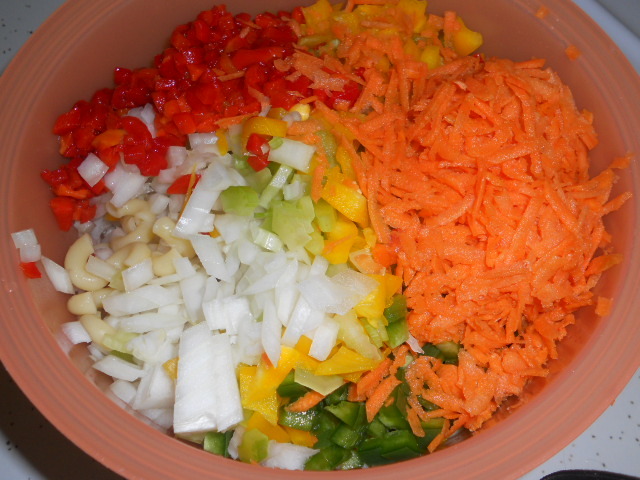 Place all raw vegetables, rice, and seasonings to the pot. Simmer for about 30-45 minutes until vegetables are tender. Taste as you go for additional seasonings. Serve steaming hot and enjoy the warmth on a cold day! Posted in Recipes, Soup and tagged Broccoli, carrots, celery, chicken bones, Chicken soup, chicken stock, cold days, COOK, healthy eating, Home, leftover chicken, quinoa, Recipe, Soup, thyme, vegetables, warm up, wild rice. Bookmark the permalink. Like most people we love to snack. Being a stay at mom has its downfalls, the kids are always eating so you usually are also. I try to prepare lots of vegetables and healthy snacks at the beginning of the week. Having everything cut up and placed in a clear container in the fridge makes things very easy to grab and go. I love to place a platter of healthy food on the table if we are home the whole day. It may look like a ton but before the day is over the plate will be clear. We just ate a whole plate of fruits and vegetables without even knowing it. If we are headed out for the day to run errands I try to pack containers in a cooler to snack on. I am sure I am not the only one who gets hungry when aways from home. When hunger hits it helps to have a healthy snack before starvation hits and you become desperate enough to stop for some junk. The platter below is just a sample of what we had on hand. Pick vegetables that your family loves or maybe a few new ones to try. Sliced apples or oranges are great. If we have some hummus, award-winning cottage cheese dip, or even a smear of peanut butter it makes it even more fun. Just watch how long the cottage cheese dip is out, ours doesn’t last long enough to spoil. I never thought kids or I would like hard-boiled eggs on their own, salt and pepper does wonders. 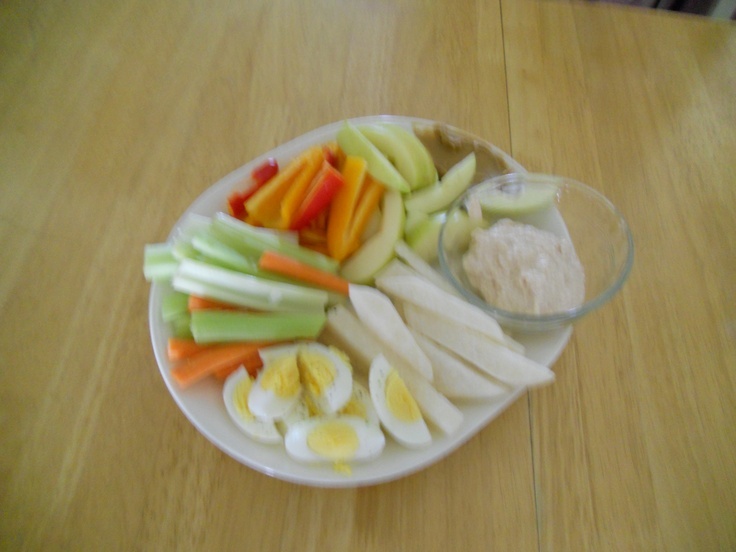 Posted in About Me, Appetizers, Recipes and tagged apples, carrots, celery, dip, hard boiled eggs, healthy snacks, Hummus, jicama, kids snacks, packing healthy snacks, peanut butter, peppers. Bookmark the permalink. After pickling green beans and pickles last year, I wanted to expand my canning and try something new. I had tasted a pickled dill carrot at a friend’s house and to be honest with you had never thought to do carrots. I went searching for pickled carrots and found Dilled Carrots | Cooking Mamas. As it turns out it is nearly the exact recipe I use for pickles and beans. They look tasty and can’t wait to update you when I open a jar. Unfortunately it will take at least 2 weeks before they are ready. In a large stainless steel saucepan, combine vinegar, water and salt. Stir well and bring to a boil over medium-high heat, stirring to dissolve salt. Place 1/2 to 1 clove of garlic, 1 head of dill and 1/2 tsp of hot pepper flakes, if using, in each hot jar. Slice carrots into sticks that work with the mason jars you have, allowing for the tops to sit 1/2″ below the last jar thread. Pack carrots into hot jars and top with second head of dill. Ladle hot brine into jars to cover carrots, leaving 1/2″ head space. Wipe the rims and center the lids on jars. Attach the screw band until tight. Place jars in canner, ensuring they are completely covered with water. Bring to a boil and process for 15 minutes, adjusting for altitude. Remove canner lid. Remove jars to a towel and allow to cool completely and store. Posted in Canning, Recipes and tagged brine, canning, canning bath, carrots, dill, dill carrots, Garlic, jars, pickled carrots, pickles, pickling. Bookmark the permalink. I had this beautiful head of cauliflower to use up and wanted to change it up from the usual seasoned roasting side dish. Although my kids will gobble it down when I use my Seasoned Roasted Cauliflower recipe, I was looking to make a main dish. I had saved Creamy Cauliflower Sauce – Pinch of Yum a long time ago and figured I would give it a try. I used her inspiration to create my variation and make my dish into a vegetable risotto like dish. I couldn’t believe how creamy the cauliflower got when blending, and in my recipe I did not add milk or cream. When I got to the point of adding milk, I realized it was completely unnecessary because the cauliflower was amazing on its own. My mother has always made cauliflower cheese soup and used an immersion blender but not to the point of completely smooth texture. If I didn’t already say it, amazing idea and way to incorporate vegetables so no one knows. After making my sauce I had to decide what to do with it. I had brown rice in the cupboard, lots of vegetables in the fridge, and a bit of frozen chopped prosciutto in freezer. I figured this would create something wonderful and it did. We ate this two nights in a row and plan on making regularly. Both kids had seconds of this vegetable loaded dinner. Easily remove the prosciutto and make it vegetarian. The sauce made about double what I needed for the rice but I used the rest later in another dinner. I imagine that you could use all the sauce or it would probably freeze fine for a quick dinner in the future. Place the rice and water in a pot with salt and bring to a boil, reduce to a simmer and cover to cook for 45-50 minutes. About 20 minutes into cooking I tossed in my frozen peas and carrots, to the rice gave it a stir and allowed it to finish cooking. If using white rice use the recommended amount of water for 1 cup rice, and put the vegetable in when you turn down to simmer because white rice cooks faster. While the rice is on, place cut up cauliflower in a pot with a steamer basket with about 2 cups of stock. If you do not have roasted garlic, simple peel 4-6 garlic cloves and pop them in the pot to steam with the cauliflower. Cover the pot and steam the cauliflower until tender. Remove the cauliflower, reserving the liquid separately and place cauliflower in a blender or food processor. A blender is going to get your sauce smoother, but make do with what you have. Add salt, pepper, nutmeg and roasted garlic to cauliflower with about 1/2 cup of liquid and begin to blend. Add liquid as needed and to the desired consistency. Taste and add any additional salt or pepper. Once your sauce is done and the rice it cooked, it is time to put it all together. In a large non-stick skillet over medium heat place olive oil and additional 3-4 cloves of crushed garlic. Toss in onion and sweet peppers, cook until onions become tender. Dump in the pot of rice and vegetables mixing until all is combined and then add the desired amount of cauliflower sauce. I used about half my sauce mixture. Stir until all is hot and well mixed together. Mix in cheeses and green onions if desired. *Any vegetable would work in this recipe. Mushrooms and zucchini would taste great, added at the point the onions are added. Mix it up and add what vegetables your family will eat. Posted in One Dish Meals, Recipes, Vegetables/Sides and tagged brown rice, carrots, Cauliflower, Cheese, chicken stock, COOK, Garlic, homemade, main dish, no dairy recipe, peas, Recipe, Rice, rice dish, risotto, vegetables. Bookmark the permalink. 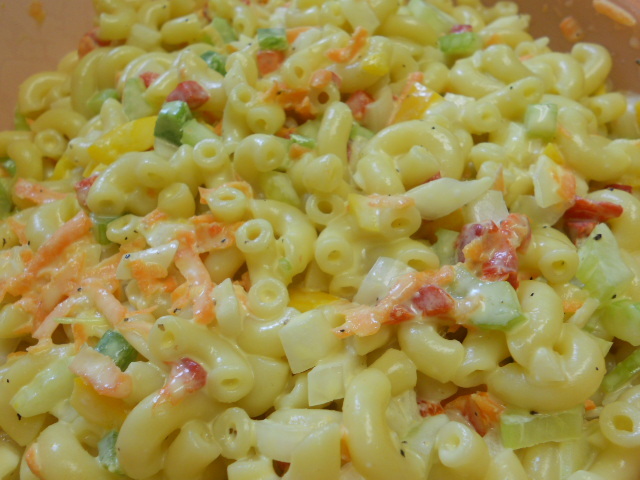 Nothing says BBQ like a macaroni salad. I refuse to eat store-bought salad because it just taste terrible. So I looked up a recipe of macaroni salad a few years ago on Allrecipes.com and have been using this recipe since. I have changed mine slightly to my liking, but you can follow the link to the original if you would like. Mr.Picky loves this salad, as well as the kids. I know the dressing is not so healthy but the salad actually has a lot of veggies in it, and the plates always come back clean. Combine cooked noodles and vegetables in a large bowl. Mix dressing and salad together, and chill for at least 4 hours for flavors to come together. *In the picture you will see yellow bell peppers and a small jalapeno being used. I didn’t have a green pepper and was not running to the store for just that. Use what you have, you just might discover something new. Posted in Recipes, Salads/Dressings and tagged Bell pepper, carrots, Macaroni, Macaroni salad, Mustard, Salad, side dish, Vinegar. Bookmark the permalink.